Properties in Kas Marina average 4.9 out of 5 stars. 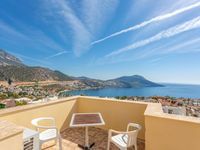 Dream apartment in Kas with panorama view + complete equipment. Property 4: Dream apartment in Kas with panorama view + complete equipment. Property 17: Luxury Penthouse with rooftop pool, stunning sea views, 5 min stroll to town. Wonderful Flat with Amazing View! Property 20: Wonderful Flat with Amazing View! Apartment with Fantastic Sea Views, Infinity Pool and Free WiFi. Property 23: Apartment with Fantastic Sea Views, Infinity Pool and Free WiFi. Cactus 213 - top-floor apartment with beautiful views on 4 star resort. 4 pools. Property 26: Cactus 213 - top-floor apartment with beautiful views on 4 star resort. 4 pools. Town Centre One Bedroom Apartment With Private Sun Terrace & 185m2 Shared Pool. Property 31: Town Centre One Bedroom Apartment With Private Sun Terrace & 185m2 Shared Pool. Luxury 3 bed duplex apartment with large PRIVATE pool, WIFI, close to old town. Property 36: Luxury 3 bed duplex apartment with large PRIVATE pool, WIFI, close to old town. We loved everything about our stay at this lovely apartment. It was so clean and perfectly located. Walking distance to restaurants, bars, shops and beach. We will recommend this apartment.